“Caveat emptor” – Latin for “let the buyer beware.” This adage is especially true for commercial real estate transactions, which is why it is so important for the purchaser to conduct proper due diligence. What is due diligence and why is it necessary? Due diligence is generally defined as, “a comprehensive appraisal of a business undertaken by a prospective buyer, especially to establish its assets and liabilities and evaluate its commercial potential.” In the context of purchasing commercial real estate, due diligence means a thorough investigation of all aspects of the property, primarily to confirm you know what you are purchasing and that there are no surprises after the transaction closes. Carrying out due diligence the right way can be costly because it could involve hiring experts in a number of different fields, but, it is worth the expense; buying a property without conducting proper due diligence could lead to financial disaster. A good real estate attorney will ensure that the purchase contract allows for sufficient time to conduct proper due diligence and also includes provisions for terminating the transaction and getting a refund on the deposit if certain conditions or circumstances are discovered during due diligence. Proper due diligence should include investigating every aspect of the property, including rights conveyed, title reports, environmental inspections, building and zoning code compliance or restrictions, insurance policies, lease agreements, and all financing issues, including contracts and future ownership costs. 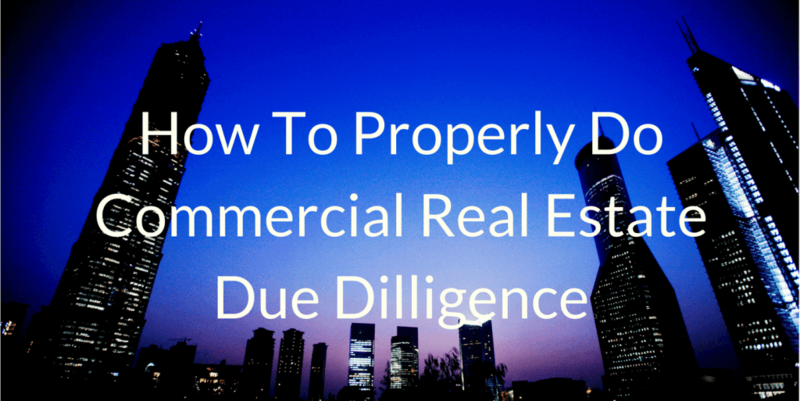 This article discusses the major parts of due diligence in purchasing commercial real estate in three main areas: the property itself, inspection/investigation, and costs. First, one should immediately obtain a title report, title insurance, and survey (using a title company of one’s own choosing). These documents should disclose whether or not the property has any liens, easements, encumbrances, inaccurate legal descriptions, or if any errors were made in the chain of transfers. Have your real estate attorney review these documents so that the deal can be promptly terminated if any issues are found in the title of the property. The title insurance policy should reveal every easement, encumbrance, covenant, and/or restriction appurtenant to the property. Copies of the “as built” plans and specifications for the property should be requested from the seller. It is also important to confirm that the seller actually has the legal right to convey the property. A purchaser (and counsel) should physically “walk” the property, identifying improvements, fixtures, landscaping, tenant occupancy, etc. This inspection should include whether the property can accommodate any expected needs, especially if the purchaser is the end user. The second major step in completing due diligence is to conduct all necessary inspections and investigations, including environmental, zoning, building code, and legal restrictions. Purchasers of commercial real estate should retain the services of an experienced environmental consultant and a geotechnical engineer to advise on environmental studies and reports that may be needed, including soil, radon, lead paint, and asbestos. The Phase I Environment Site Assessment is the minimum standard for most lenders in commercial real estate deals. The purpose of this inspection is to determine if the property has any hazardous materials or poses a threat to its surroundings. Hazards could include underground storage tanks; runoff from the property into rivers, lakes, the ocean, or water tables; or any other hazards listed by the Environmental Protection Agency. If a site is suspected of being contaminated, a Phase II report with sampling may be required. If a site has confirmed contamination from a prior user or if an environmental hazard has been identified in a Phase II report, the site will require a Phase III report, remediation, and ongoing monitoring. Once the issues are resolved, a “No Further Action” (NFA) letter is issued. It is very important to review the city’s zoning ordinances to verify that the property is legally zoned for what you intend to do with the property. The purchaser should inquire and satisfy themselves as to the zoning for the property and whether any special use or conditional use permits are in place. This is especially true if you plan on changing the use of the property. For example, if you intend to build residential homes on property that is only zoned for commercial use, you will need to obtain a variance from the city zoning commission before you begin construction. You should also look for maximum density requirements, development standards, and other information that may indicate that the property can be expanded or eligible for a change in use. Lastly, you should hire an expert to inspect the property for any possible building code violations, which could include unauthorized construction, substandard electrical or plumbing work, structural problems, or improper materials used in construction. Any discovered violations should be cured by the seller before the transaction closes. To start, basic loan questions should be asked, answered, and analyzed. These include, but are not limited to, questions about the amount of the loan, interest rate, collateral, repayment terms, and reserve requirements. There should also be an analysis of the requirements for a minimum interest yield. If the loan is to be used towards any construction, the requirements for the construction loan should be separately analyzed, including draw, repayment, and whether all construction costs have been included. For investors (as opposed to end-users), it is important to examine all service and vendor contracts that may be in place for the property. These could include contracts for maintenance, landscaping, cleaning services, and/or food supply. Review these contracts to that confirm you have the right to discontinue the services if you choose, and, more importantly, to confirm the accurate pro forma of the rent rolls vs. expenses of the occupying tenants. Check to see if the equipment is still under warranty and if the warranty is transferrable. In addition to contractually-obligated costs, make sure you calculate the costs of other property-related expenses, such as improvement/business districts costs, special assessments or fees, property taxes, insurance, and/or any fees owed to third parties, such as parking. Although this article contains many of the aspects of commercial real estate due diligence, it is not intended as an exhaustive list, and the purchase of commercial real estate should not be handled without the assistance of a competent commercial real estate attorney.